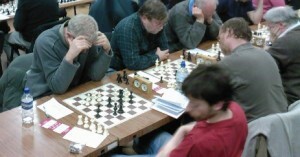 The First Weekend In February is when chess fanatics from all over England gather for the Kidlington Chess Congress. Unlike last year I had had much more practice and felt more confident of doing well this time. Last year I played four games: I drew three and lost one. Not great, but OK for not having played competitively for so long. This year I was playing in the Under-145 tournament: my last posted grade in the 1990’s was 139 and my performance last year was equivalent to about 130, so this seems reasonable. In fact, this year all of my opponents had grades in the 130s. Round One: As Black I managed to get a mediocre position out of the opening. I was definitely a little worse when my opponent made a mistake which meant he had to give up his Queen for a Rook and Bishop. This was good for me but, ultimately, the placing of the remaining pawns and accurate defence by my opponent meant that the game ended in a Draw. Score 0.5 out of 1. Round Two: As last year, I took this round (Saturday afternoon) as a pre-arranged bye, to avoid spending the entire weekend away from the family. So that was worth another half point; score 1.0 out of 2. Round Four: Playing Black, I opened with the Caro-Kann defence, which I’ve never played before competitively. Without making any obvious errors I got into a position where my opponent had a huge amount of play and plenty of attacking options; I didn’t really have much choice other than to defend as carefully as possible. When his attack fizzled out, my opponent made a misjudged sacrifice of rook for bishop, hoping for compensation to continue his attack; this didn’t work and from then on, I was on the offensive. It was a long game, more than three hours, but I eventually managed a second Win. Score now 3.0 out of 4. Round Five: In the final round, I played the Morra Gambit as White, which I haven’t done before: he played the 3. … d3 line which is essentially the Morra Gambit Declined, which meant that I had a reasonable position out of the opening without having sacrificed a pawn. My opponent castled riskily into a Queen’s side attack and the game finished rather quickly, although I made a mistake right at the end which, fortunately, he missed. That was my third Win in a row and left me with a very respectable score of 4.0 out of 5. Overall this was a very good tournament for me: I scored 3.5 out of 4 over the board and remained unbeaten. My calculations show that my grade for this tournament was around 170, with which I’m very happy. I still haven’t played enough games in the last two years to get back on the ‘official’ English Chess Federation grading list, but maybe if I play again next year… ?